Baseball is a sports that Americans love and kids baseball is a great way for children to exercise, play in a team sports and build confidence. By playing baseball, children run, build strength in their arms and shoulders, develop coordination, and learn to play with other teammates. What's also great about baseball is that you don't need a full team to play and that you can practice many things alone. For example, you can practice batting in your backyard with someone or with a pitching machine. In order to properly play baseball, you need the right equipment. Baseball is a precision sport that requires a lot of skill. If you don't get the right ball, the right bat or the right gloves, you will not be able to learn how to play the game properly. It is kind of like choosing the right musical instrument when you are learning music. We recommend that you buy professional and good quality equipment, especially if it is for children of ages 8 years and above. 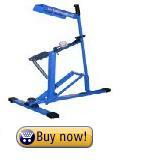 Fortunately, you can buy the equipment online at reasonable prices. When choosing the equipment, you have to be very careful about the size and weights and make sure they match your child's age. When choosing the ball, make sure that it is licensed by the major leagues, meaning that it is made of the right materials and that it matches regulation for size and weight (size should be 9 inches and weight 5.25 ounces). By the way, Rawling manufactures balls that are licensed by the major leagues. This website offers great information and baseball drills for little league coaches, and a special section for those coaching tee ball. If you are just starting out coaching a team, or looking for some new and helpful baseball drills, this is the website to visit. Regarding the baseball bat, you should also make sure it is the right size (maximum length should be 42 inches and maximum diameter should be 2.75 inches). You can use the table below to determine the right size. You should buy one that can control and that can swing properly. You have many choices of baseball bats. You might be tempted to get an aluminium bat because aluminium bats are usually cheaper, lighter and have more power. However, we recommend that you get a wooden bat for the feel when you hit the ball and because it is the kind of bat used by professionals. When you buy a wooden bat you should pay attention to the quality of the wood. We like the Louisville Slugger Youth Wood Baseball Bat. Louisville Slugger is a brand that we like. The company has spent over 120 years making baseball bats. They manufacture really good products that are also value for money. This specific bat is made of high quality maple wood. It is made specifically for youth league players (sizes: 26 to 31 inches). Regarding the glove, here again you should make sure that it is the right size. You can determine the size using the table below which gives you the right size by age and position. If your kid is tall for his age, use a bigger glove (for kids one year or two years older than his age). The glove has to be made of leather (and not vinyl or plastic). 8 - 13 Infield 9-10"
9 - 13 Outfield 11-12"
13 and older Infield 10.5-11.5"
13 and older Outfield 12-12.75"
We recommend the Louisville Slugger glove. It is made of top quality leather. It is designed for developing players and can be used in multiple positions. The glove received lots of positive reviews and is really great value for money considering the quality of the leather and the fact that it feels like a professional glove. A helmet is needed to play kids baseball especially if you are a batting. It protects players, bearing in mind that the ball can fly very fast and can severely injure the head. We recommend helmets with one earflap (two is even better). Again here you should get a proper helmet that can really protect the player. Cleats are not required. You can play kids baseball using any athletic shoe however baseball cleats are recommended. Cleats are light and have spikes and they help players not fall to the ground as they run around the bases. Other stuff that you need to play baseball but not mandatory especially if you play in your backyard is a glove for batting, a mask for the catcher, a uniform (jersey) and a cap. A pitching machine is also great to have especially if you want to practice batting. If you want a decent pitching machine, meaning a machine that pitches in the same direction all the time and that doesn't require batteries that run out all the time, you are going to have to spend some money, over 100 dollars. But for less than 200 dollars you can get a really good pitching machine. Louisville Slugger also has a great pitching machine. What we like about it is that it is light, sturdy, doesn't require electricity and most importantly, it is accurate. The pitch direction and speed can also be adjusted. Make sure that you also learn the rules of the game. You and your child will enjoy playing and watching baseball even more.